On Saturday 28th July 2018 the Wincanton Armed Forces and Veterans Breakfast Club held their first meeting at The Dolphin Hotel, Wincanton. 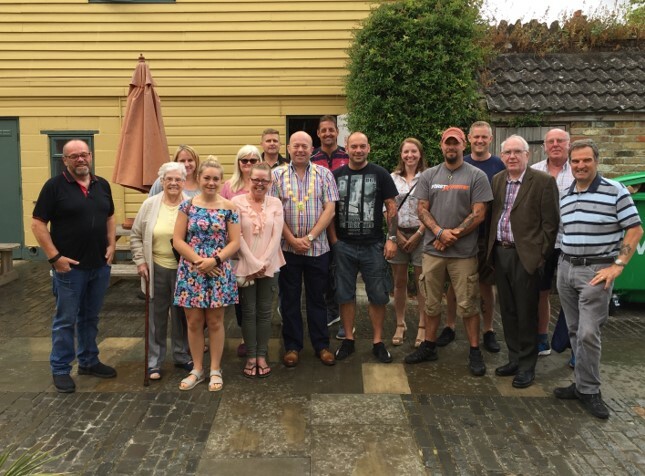 The towns Mayor Howard Ellard was present to welcome the newly established group. Facebook Admin, Neil Anderson explained the purpose of the breakfast club and thanked the hosts Paul and Kaye for providing a delicious all you can eat breakfast buffet and for the fantastic surroundings of the groups very own Stables. Just over 20 members attended, with some of those travelling from surrounding villages and towns including Templecombe, Castle Cary, Bruton, Somerton and Yeovil. A noteworthy attendee was serving soldier Pte Katie Garrett who was accompanied by her veteran Dad (Ex Vehicle Mechanic in the REME) and Grandma (Ex Royal Artillery). Katie’s grandmother served in the Second World War and we are looking forward to hearing some of her stories. The group can only go from strength to strength as word of mouth and social media spreads to others. All future meetings will be held on the last Saturday of each month, therefore the next get together will be on Saturday 25th August 2018 at 0945hrs at the same location. All serving members of HMF and veterans are most welcome to attend. For more details please search for the facebook group – Wincanton Armed Forces and Veterans Breakfast Club.